Irish Luck Video Slot Guide & Review - Casino Answers! Irish Luck is a 5-reel, 30-line video slot developed by the Playtech casino software provider, featuring scatter wins, wild substitutes, multipliers, free spins, a gamble feature and a bonus game. You can play the Irish Luck Playtech video slot at Bet365 Casino and Europa Casino. To start playing the Irish Luck video slot game, you must first choose either $0.01 or $0.05 as your coin value. From there, you can choose your bet per line from 1-10 times your coin value (essentially 1-10 coins). You can also set your number of active paylines (up to 30). The minimum bet on Irish Luck is $0.01 per spin and the maximum bet is $15 – a very low maximum bet. When you’re ready to start playing Irish Luck, either hit “Bet Max” to play all 10 coins at your coin value or use the “Spin” button to spin the reels with the wager you have placed. The top jackpot on the Irish Luck slot machine is the Irish girl symbol. Five of these symbols will win you the 10,000 coin top jackpot. The symbol is also Irish Luck’s wild symbol. It is stacked on all reels. It substitutes and doubles your winnings for all symbols except for the scatter symbol. The scatter symbol is the Gold Pot symbol. Three Gold Pot symbols will trigger The Gold Pots bonus game where you can win up to 33 free games and a 15X multiplier. You will automatically be awarded 8 free games with a 2X multiplier before you enter the bonus game. 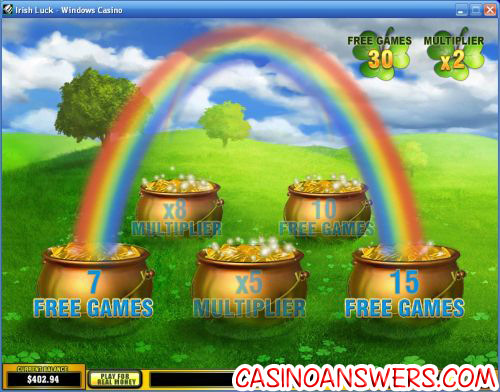 In the bonus game, you must pick two of the five Pots of Gold to win additional free games and multipliers. You can win more free spins in the feature with the same multiplier to infinity. Irish Luck also has a gamble feature that can be used after any win you receive. Your goal is to correctly guess whether the next card will be red or black. If you win, you will double your winnings. Exit the gamble feature by using the “Collect” button. There is a Double Up limit that you will be able to find in the game’s Info. In the case of Windows Casino, that limit is $1500. Two more features on Irish Luck are Skill Stop and Autoplay. Skill Stop will stop the reels in the middle of a spin. Winning combinations will then be paid out. Autoplay is found near the left of the game buttons. You can type in as many autoplay spins up to 99 and then hit the “Auto Start” button to play. You may cancel autoplay at any time. If you feel you have been blessed with some good ol’ fashioned Irish luck yourself, you can get a 100% up to $200 signup bonus to play the Irish Luck video slot at Bet365 Casino! Are US players able to play the Irish Luck video slot for real money? Unfortunately, US players cannot sign up and play at Playtech casinos for real money. 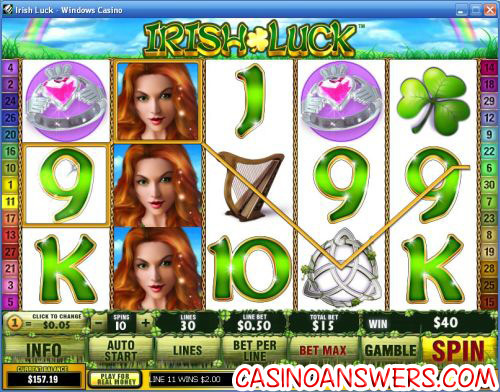 For a US-friendly Irish-themed video slot, please read our Lucky Last Irish Video Slot Review. Does the Irish Luck slot game have a progressive jackpot? No, Irish Luck does not have a progressive jackpot. You can find a 10,000 coin fixed top jackpot on Irish Luck, which may be enough for most players, but if it’s a progressive jackpot you want, we will once again suggest you read our Lucky Last Slot Machine Review for an Irish video slot with two progressive jackpots. Can I play the Irish Luck video slot for free? What is the Irish Luck Slot Machine? Where can I play the Irish Luck Casino Game?